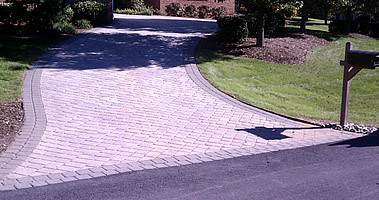 A Paver Driveway will add beauty and value to your home. Paverscape inc. will design and install your Pavers to perfection, exceeding all of the latest industry standards to assure it will last forever. Our Pavers come with a lifetime factory warranty, even against de-icing Products. Also available as an option we can heat your driveway, so you never have to pick up a snow shovel again. Or maybe you wish to install permeable pavers to enhance rain water run off into a water harvesting system. Residential or commercial, Pavers are a superior choice and will out last concrete or asphalt. EP Henry Olde Town Cobble pavers in a random pattern with charcoal brickstone border. Techo-Bloc paver driveway using the Hera paver in random pattern.